I thought, maybe I could cross my mahout dreams off my list and drag P to the Elephant Nature Park in Chiang Mai, Thailand or see the mother of all temples in Angkor Wat in Cambodia. Then my brother-in-law was asked to exhibit his photos in White Canvas Gallery in Singapore last month. Of course, we had to go. Plus, it was an excuse to see friends who had relocated there. (More on Singapore later on.) Chiang Mai and Angkor Wat had to wait. But what do you do when your feet are still itching to go someplace? You plan a trip nearby that’s what. I have always wanted to see the famed Banaue Rice Terraces. The more than 2000-year-old man-made terraces carved into the Cordillera mountains up north are a big tourist draw and, along with the rest of the Philippine Cordilleras’ other amazing rice terraces, it gained UNESCO World Heritage Site status back in 1995. Though more and more people report that the rice terraces of Banaue are in poor condition, suffering from erosion, littered with garbage, and just generally being neglected (hello, tourism folks! 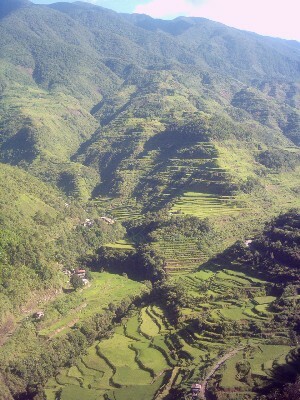 ), the other rice terraces in the area—Batad, Hapao, and Mayayao—are still worth the trek up north. I even found a traditional inn overlooking the Hapao terraces, Uhaj Native Inn, which from the reviews in TripAdvisor didn’t sound like an overrated and overpriced lodging like some of the established hotels and inns in Banaue.